Oh hello, it's somehow time for another budget post! This month I managed to stay a little more season-appropriate than January (well, besides the cover-up ;) and apparently I'm no longer like colors. 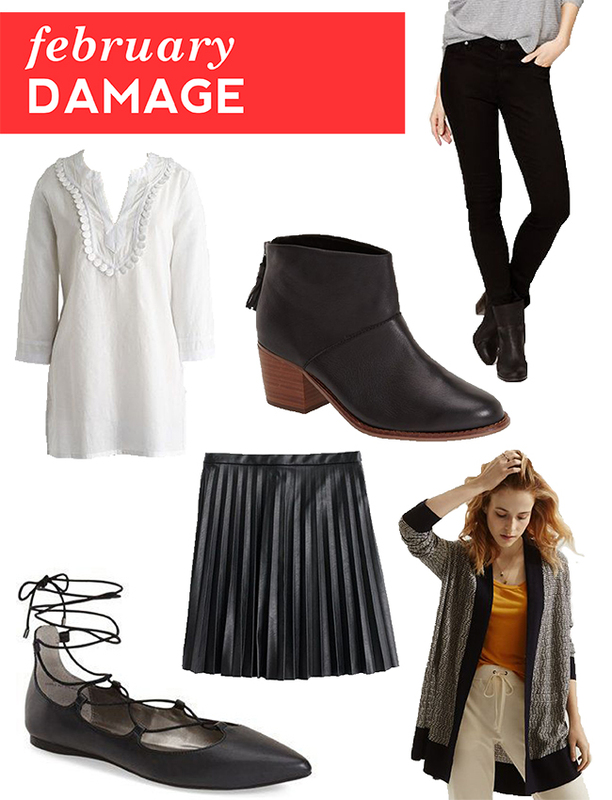 I did pick up a few things that I've been wanting for months, like the lace-up flats and the skirt, and filled some holes in my closet with the black denim and booties. The booties may be my favorite purchase of the month. While I love the flats, I've been searching for black booties for over a year at this point (picky, much?) and these are perfect. I can't believe they're Toms because they're so cute, and they're comfy enough (even with the heel!) to walk around all day in. I even hiked up the hills in San Francisco in these bad boys and accidentally took a wander into the Tenderloin and they worked equally well for climbing hills as running back in the direction I came from. J. Crew Factory Tunic - originally $69.50, on sale $31.05. I can't wait to wear this on all of our summer vacays!! TOMs Booties - $138.95. I seriously love these, and wore them earlier this week. LOFT Denim Leggings - originally $69.50, on sale $41.70. When these came I couldn't remember if they were supposed to be jeans or leggings. Oh, denim leggings! Both of me were right. J. Crew Skirt - originally $128, on sale $96, used giftcard $0. I think this has been on my wishlist since over the summer, but it was so much more than I'd usually pay for a skirt that I didn't really consider it. Usually I'd just take an item off the wishlist after writing it off, but I couldn't get my eye off of this little cutie, plus it never went out of stock, so since I got a giftcard for Christmas I decided to finally bite the bullet. Lou & Grey Cardigan - originally $69.50, on sale $21.95. I never buy anything on final sale when I'm online shopping, because, you know, then I'm stuck with it. This was such a good deal, plus it got me free shipping, so I decided to just go for it, and I'm so glad I did - it's so comfy and goes with everything! I somehow came in right under budget, despite at one point having about $500 worth of stuff on my budget Pinterest board for the month. A lot of things didn't work out, like this tee (weirdly oversized), this blouse (too hospital scrubs-y), and this dress (just meh). For March, I'm on the hunt for a new pair of denim and a fancy work tote. And probably one million other things that I won't be able to wear for months, because Chicago.